Floating Reed islands are bespoke portable floating refuges, which provide instant cover, habitat and protection for fish, invertebrates and mammals. 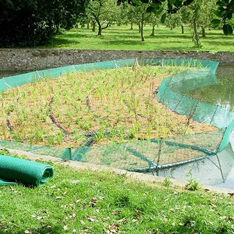 The modular floating frame supports pre-established (vegetated) coir fibre plant pallets. British Flora can offer a complete design, supply and installation service for floating islands. British Flora Green Roof Brochure Available Now! All of your native British wildflowers in JUMBO PLUG sizes! British Flora Aware of Bees’ Needs – A call to action for our pollinators! Copyright © 2018 British Flora. All rights reserved.